In Lake View’s first grade classroom one teacher and forty students stare dutifully to the left. They occupy a Spartan room with fixed desks and only an American flag to decorate it. CL, Mar 5, 1908. Reading Class: Easter Lilly. First And Second Primary Grades. Teachers College, c1900. In this class, six teachers work with fifteen students. Two of them lean toward the children and their work. A potted lily stands to the left of the blackboard, with another drawn in chalk beside it. The lesson probably integrates reading William Blake’s “The Lilly” with botanical study. Teachers College Archive. Rice embraced what he called the new “science of education” and frowned on such mechanical instruction. 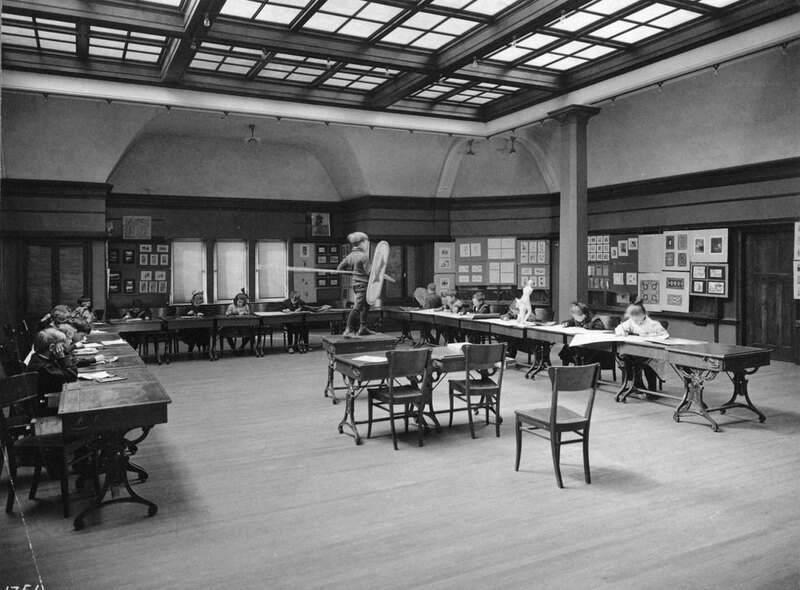 In progressive-minded training programs, he explained, teachers learned to penetrate At the University of Chicago Laboratory School, a boy poses as a Viking for the rest of his drawing class. The art class was part of a larger lesson on Norse history. No surviving sources show this kind of engagement at the Lake View School. U of Chicago Archive, c1904. to the psychological heart of children, to place themselves so fully in the minds of students that learning became a shared, intimate pleasure. 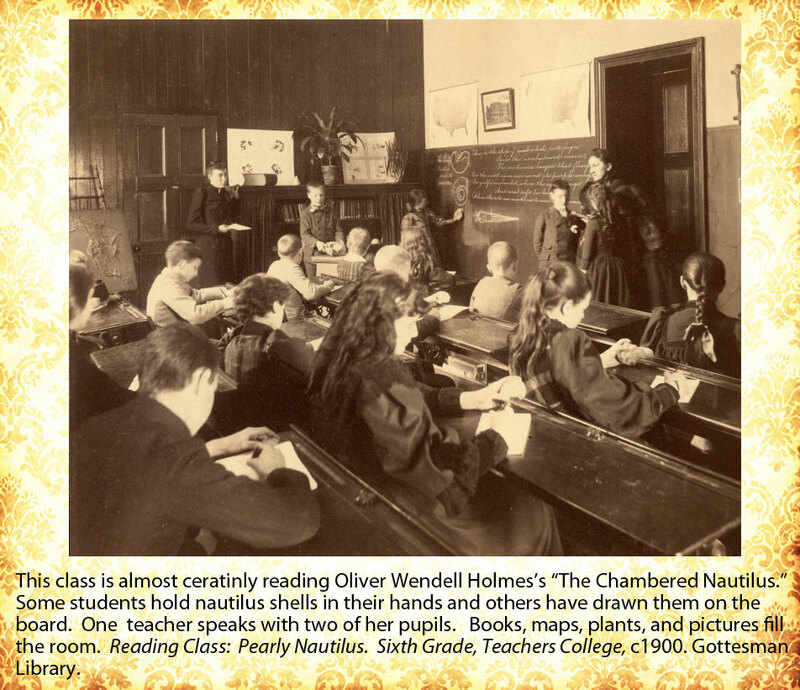 The teacher must “study the needs of the child” and assure that “a bond of sympathy forms between [her] and the pupil.” The mindless repetition and “barbarous” corporal punishments of old-time teaching had no place in such a relationship, as students internalized the joy of learning. All lessons, thought Rice, should have experiential, tangible accompaniments that solidified words and other abstractions, making them physically meaningful to still developing minds. Students could best learn the scientific vocabulary of Botany, for example, not by spelling “blossom” in unified song, but by gardening. Reading and writing exercises then grew out of their gardening experience. Nurturance, psychological intimacy, and the pursuit of curiosity in the material world—along with the careful monitoring of hygiene and attendance—drove the new “science” of Progressive instruction. 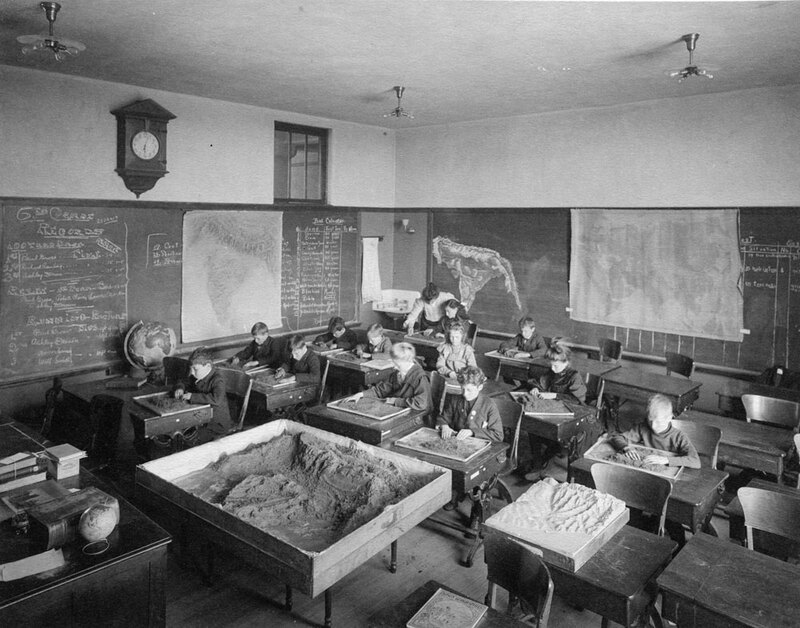 Teacher training programs validated these principles and put them into practice at experimental Sandboxes, globes, maps, and lesson outlines surround the twelve students in this class at Chicago’s Laboratory School. At the back of the room, a teacher leans over the shoulder of a girl to help with her work. U of Chicago Archive, c1904. schools affiliated with some of the most prestigious universities in the nation. 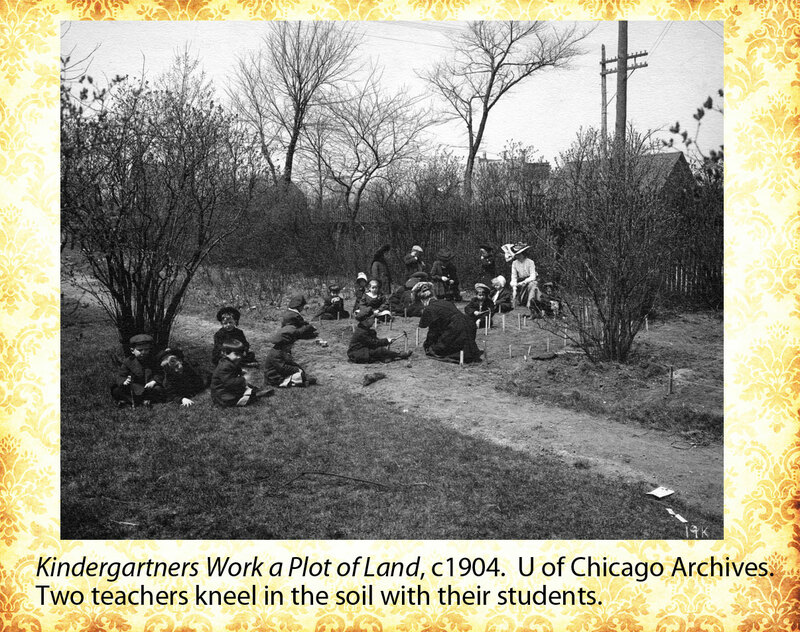 The University of Chicago’s Laboratory School and the Horace Mann School at Columbia’s Teachers College were two of the most visible examples. While this new model of instruction unburdened children of sing-along spelling, Progressive classrooms pushed other levers of behavioral control. Every action, every thought, every architectural element of the school was aimed at the lovingly watched child. The teacher sought, figuratively speaking, to be with her students always, to impart knowledge, feelings, ethics and experiences that would be carried into home life. Plants, pictures, and models in a classroom steered students’ curiosity in calculated directions. Even the most unruly groups of immigrant children, Rice and others insisted, could be managed into civility through strategies of educational intimacy and without harsh corporal discipline. Did teachers in the Lake View School embrace the new science of teaching? 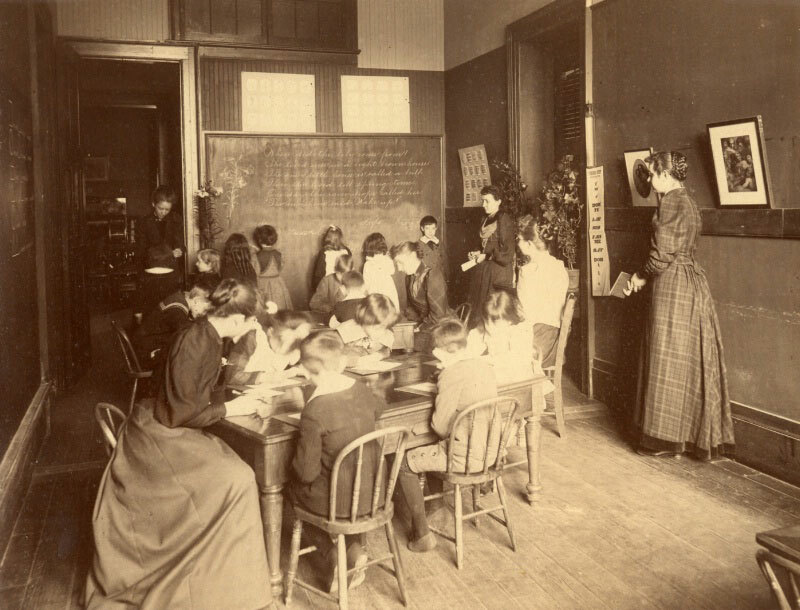 Did they follow Rice, John Dewey, Francis Parker, and other leaders of Progressive education, or did they persist in harsh Fifth Grade Classroom at Lake View. Utica Saturday Globe, Mar 14, 1908 punishment and repetitive drills? It must have been a challenge to manage and control their polyglot, overcrowded classrooms. In what ways did they share bonds of intimacy with their numerous “foreign” students? Such questions don’t have simple or definitive answers, but hints are abundant. In Rowley’s memory, she could not control the actions of her children. Consumed by fear and panic, they left her helpless to guide them. At the end, as the pile at the doorway grew, she had no choice but to save herself and the few who heeded her. Rowley left the children and jumped through a window. Others told similar tales of the teachers’ helplessness in the face of disaster, seeming to cast blame on frantic children. Such accounts told a truth about the mayhem of the fire as overwhelmed teachers experienced it, but they also raised questions. Hadn’t the children learned to trust and listen to the teachers charged with their care? Why weren’t the ties between them stronger? 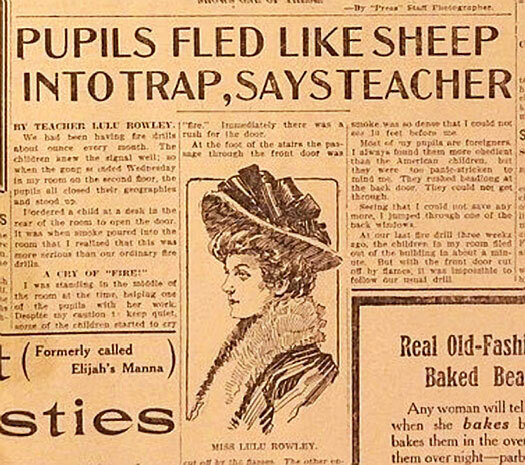 How did the panic get so quickly beyond the control of those trained to educate children? 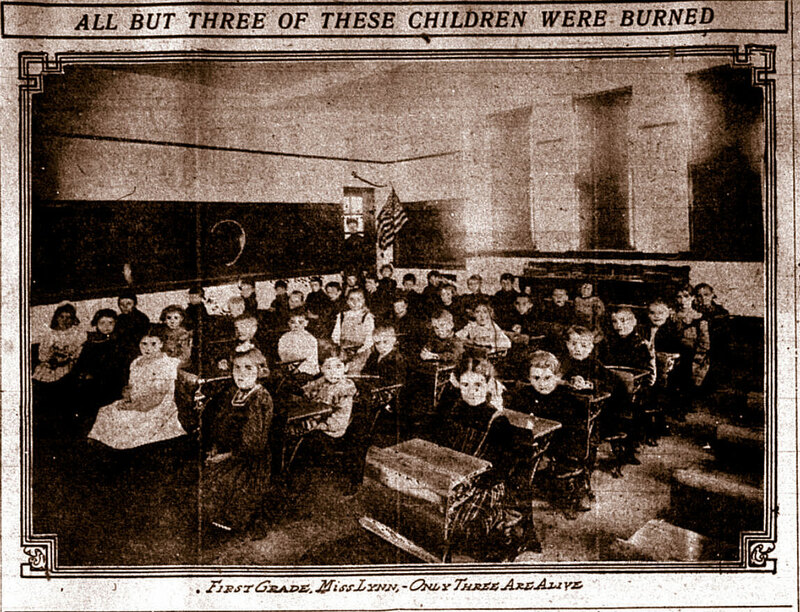 Under oath at the Coroner’s inquest, Frank Whitney, Collinwood’s Superintendent of Schools, faced a daunting and unanswerable question: “How do you explain that so many of the teachers got out and so many children were killed?” “I could not answer,” replied Mr. Whitney. Rowley’s story of frantic students and unheard pleas for them to listen clashed with any idealized vision of student-teacher reciprocity. Somehow, when it mattered most, she had failed to enter the hearts and minds of the children. All she could do was leave them for dead.